Hi everyone, I hope you are all doing well! I updated my trigonometry notes. I remade the diagrams utilizing LaTeX and reorganized the information. It was originally supposed to be one handout, but there was so much information so I had to divide it. Like I said earlier, trigonometry plays a huge role in further studies in fields such as physics, chemistry, and engineering as well as topics such as related rates and polar coordinates in calculus. This is why I went in depth with the handout on this topic. Part I was close to 30 pages (28 pages long). Those of you who have read my handouts know that they are usually 10-15 pages. Even at 28 pages, there was still more information to cover. Part II will cover trigonometric equations, graphing, and applications. I didn’t want it to be overwhelming which is why I divided it. I hope you enjoy the read. I know many times trigonometry is taught just through pure memorization. I disagree with those methods. This is why students freeze up during exams or just get burned out. I added mnemonic devices and other methods I used to help my former students learn the material. I focused more on understanding the concepts rather than memorization and regurgitation. I hope this simplifies trigonometry for you. I’m still finishing up typing an entry on my Fun Adventure blog so I will have that up soon too. *Updated September 16- I accidentally wrote inverse instead of reciprocal when deriving and so they are updated now here and on the main site. Apologize for that! The standard position of an angle is when the initial ray is positioned on the x-axis (some like to refer to it as the 3 o’clock position) and the vertex is located at the origin (0,0). When the terminal ray is revolved counterclockwise, the angle’s measure is positive. When the terminal ray is revolved clockwise, the angle’s measure is negative. Coterminal angles are angles whose initial side is in standard position and share a similar terminal side. where n is any positive or negative (nonzero) integer. When n is positive, we will get the positive coterminal angle to θ. When n is negative, we will get the negative coterminal angle to θ.
Let’s revisit our diagram above for 60° and -60° to determine their coterminal angles. Find the coterminal angles for 60° and -60°. 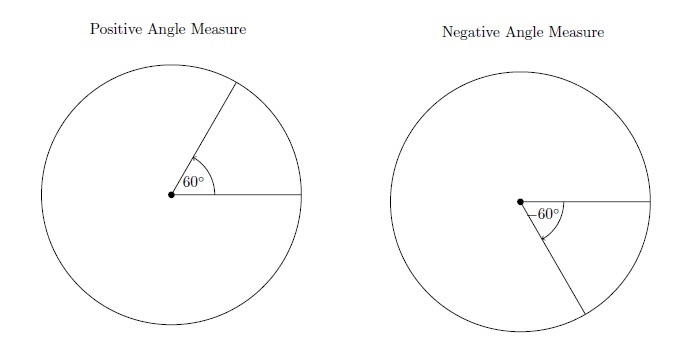 Since our angles are measured in degrees, we will use θ + n(360°). As you can see, we can determine an infinite number of possibilities for the coterminal angle to θ as a result of n being any nonzero integer. In the next section, we will find the coterminal angles to angles measured in radians. From our discussion on analytic geometry in our previous handout, we learned that the radius of the unit circle with its center at the origin (0,0) is 1 (or r = 1). 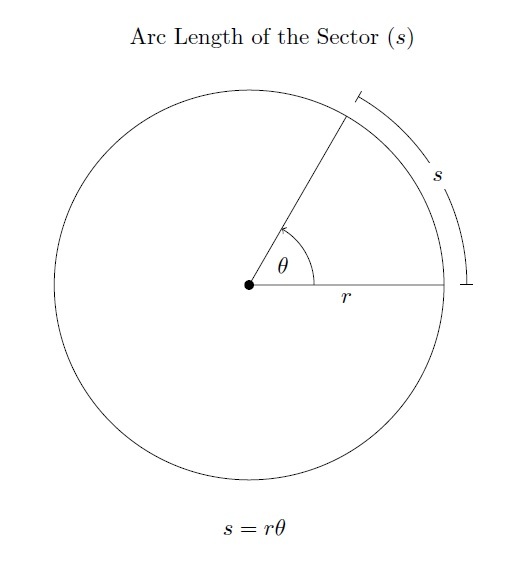 The arc length of the sector is the radian measure of angle, θ (pronounced theta). Let’s examine this through an example. A radius measures 6 feet with an arc length subtended by the angle measuring 18 feet. What is the measure of the central angle? We are given the information that r = 6 feet and s = 18 feet. Since we are given r and s, we use algebraic manipulation to isolate θ to one side. We can do this by dividing both sides by the radius. The measure of the central angle, θ, is 3 radians. There are a few important angles in trigonometry which provide a foundation for applications in trigonometry as well as further studies in mathematics. As a result, it is crucial to understand these common angles. These common angles include 30°, 45°, 60°, 90°, 180°, and 360°. For other angles, we will be able to convert between angle and radian measure. As long as you know that 𝝅 = 180◦, you will be able to get the radian and degree measures for the other common angles. Since it was easier for my students to divide using the 180°, you can try to divide 180 by 2, 3, 4, and 6 first and then do the same for its radian measure 𝝅 to get their respective radian measures. Now that we discussed the common angles, we can now convert between degree measure and radian measure (and vice versa). It was simple to figure out the conversions between the common angles, but what about 70° or ? We simplify the to and we get radians. Let’s try another example. Convert 135° to radian measure. We simplify the to and we get radians. (*When I simplified, I divided 135 and 180 by 45). Now that we learned how to convert from degrees to radians, let’s convert from radians to degrees. The one thing to remember on what to choose for the second part, or , is that the value at the top should be what you want to convert your measure to. Since 𝝅 radians is at the top, it means that we are converting the measure (in this case, degrees) to radians. Similarly, if 180 degrees is at the top, we know that we are converting a radian measure to degrees. since that would be attempting to convert radians to radians (as well as the degrees not canceling out). Likewise for the degree measure. 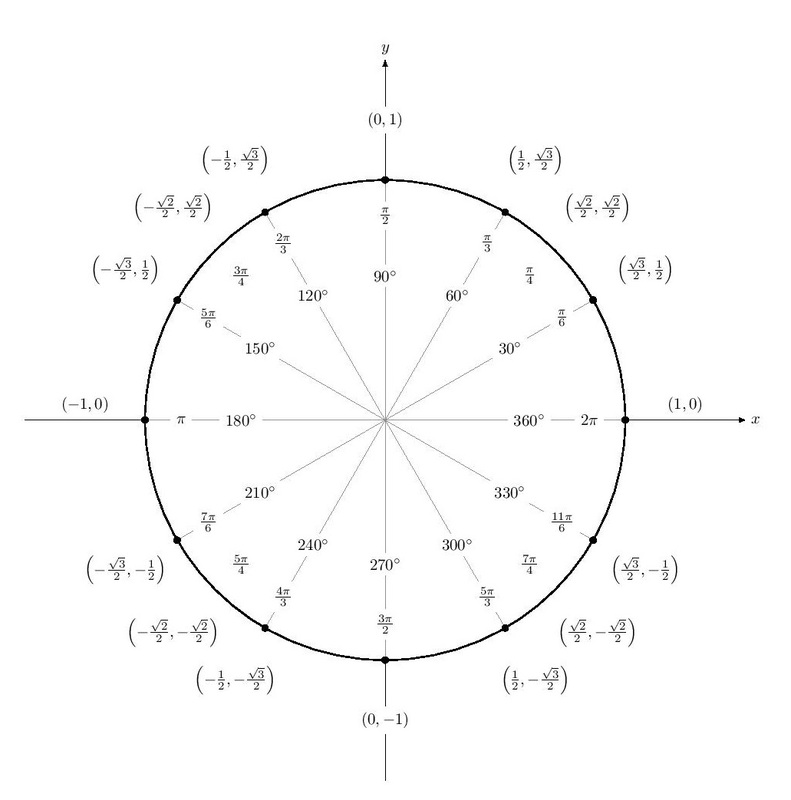 Now that we discussed radian measure, we can go back and find the coterminal angles for angles measured in radians. Find the coterminal angles for and radians. **Remember from earlier that we use θ + n(2𝝅) to find the coterminal angles when θ is measured in radians. The process is the same as for degrees only instead of 360° we use 2𝝅. You don’t have to memorize the trigonometric identities. As long as you know one trigonometric identity, you will be able to derive the others. These are often easily confused and can result in incorrect calculations! Also note that I use θ, but different books and resources also use x or u (such as sin x or cos u). You can use whichever you are comfortable with. To form our foundation, we will first look at an important foundation of basic trigonometric identities: reciprocal identities. The reciprocal identities define cosecant (csc), secant (sec), and cotangent (cot) as they relate to sine (sin), cosine (cos), and tangent (tan). 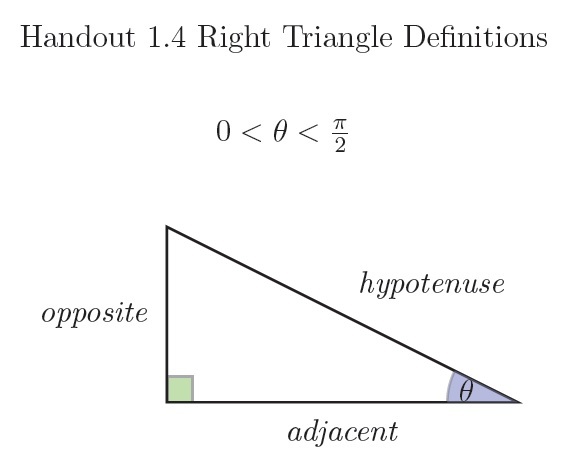 We already saw the right triangle when we discussed the distance formula in the analytic geometry handout (1.3). We are now going to define the trigonometric identities as ratios of the two sides of the right triangle. The only ones you will need to learn are sine, cosine, and tangent. We already know that cosecant, secant, and cotangent are reciprocals of the first three, respectively, so you would just need to switch the numerator and the denominator. To learn the right triangle definitions of the first three, I used a silly technique. My friends and I enjoyed the performing arts so I used reactions of amazement to shows/concerts/performances in order to remember the definitions. OH! AH! OA! (as if I was being amazed by a magic show or performance) For the third (tangent), just think of oh and ah being smashed together. I just think of it was OA (pronounced WAH!!) to represent super amazement. Hopefully it can help you, too! *After we derive the two other Pythagorean identities, we will examine this first identity using the circular function definition later on in this handout. If we want to find sec2 θ, we can keep in mind that secant (sec) is the reciprocal of cosine (cos). we want to turn the right side of the equation into sec2 θ (which is ) since we know that sec θ = from our reciprocal identities. We will also apply the tangent identity as we simplify. Similarly, we can apply the same method to derive csc2 θ. If we want to find csc2 θ, we can keep in mind that cosecant (csc) is the reciprocal of sine (sin). we want to turn the right side of the equation into csc2 θ (which is ) since we know from our reciprocal identities that csc θ = . 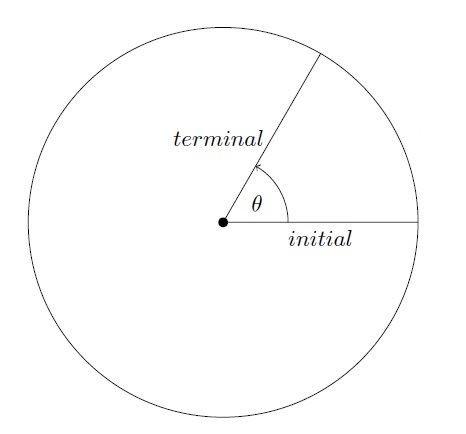 Now we will go back to our first Pythagorean identity and learn how it is defined utilizing the circular function definition. We are now going to look at #2 above: trigonometric functions defined as points on the terminal ray of an angle in standard position. Let θ be any given angle. Thus, we can conclude that sin2 θ + cos2 θ = 1. In the next handout, we will also do the same when we take a look at other identities such as the addition and half angle formulas. I didn’t need mnemonics since it was easier to remember. To begin I just thought for (“Why are! ?” like Why are there so many things to remember!?) and then filled in the rest. We will now apply everything that we learned as we evaluate trigonometric functions. If you plan to further your studies in mathematics, knowing this will be beneficial. Let’s look at the special triangles and the values of their trigonometric functions. These are located in Quadrant I (the upper right quadrant) in the coordinate plane. In Quadrant I, the signs for the trigonometric functions (sine, cosine, tangent and their respective reciprocals cosecant, secant, and cotangent) are positive. After this, we will learn the signs for the trigonometric functions in the other three quadrants. Memorizing can be tricky and confusing (especially the 30-60-90 triangle) so I’ll give a few tips to make it easier to understand. 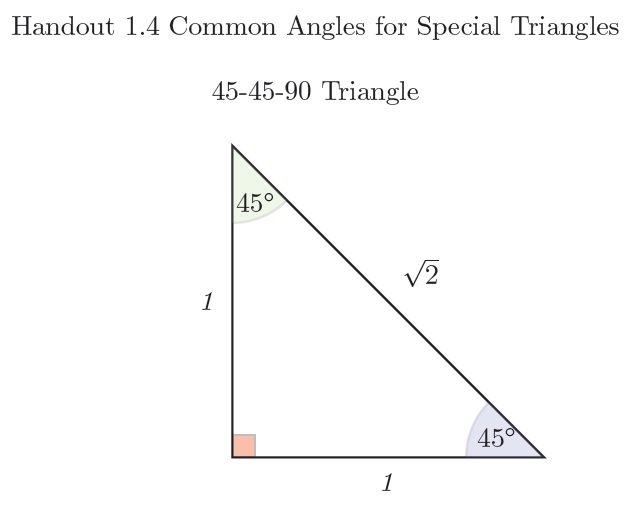 The 45-45-90 triangle is pretty simple to learn because aside from the 90° angle, the two other two angles are equal (45°). You only need to know 1 and 2 (or in this case, ). Since 45° is the smaller measure, you can assign 1 to its opposite side. You do the same for the other 45° angle since they are equal. The only angle left is the 90° angle and since that is the larger measure, you can assign as the length of its opposite side. Now the 30-60-90 is a little trickier because aside from the 90° angle, the other two angles have different measures. The lengths of the sides are also different unlike the 45-45-90 where the two side lengths were equal opposite to each 45° degree angle. To begin, I learned the sides. The numbers I will need to know are 1, 2, and 3 (or in this case, ). I started with the hypotenuse since that was easier to remember. The side opposite of the 90° angle in the 45-45-90 triangle is . Then I looked at the side opposite of the 90° angle in the 30-60-90 triangle and saw that it also had a 2! 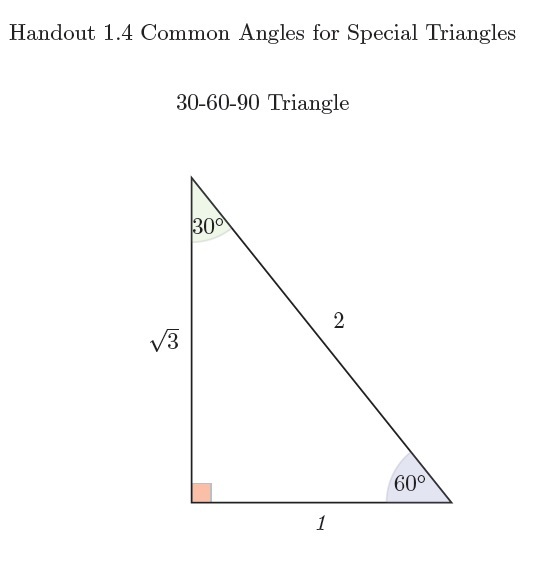 I thought since they are “different” triangles, the 2 is different in the 30-60-90 in that it is not the square root. That made it easier to remember. Now, it doesn’t matter what position you assign the 30° or the 60° angles so don’t get nervous. As long as the length of the hypotenuse (2) is opposite the 90° angle, you’ll be fine. In the diagram above, you can switch the 30° and 60° angles. It will only change the shape of the triangle. The important thing to note is the measure of the length opposite of the angle (the value of the side, just like the value opposite of the 90° angle is 2). So regardless of where you put the 30° or the 60°, the important thing is that the side opposite of it should have the correct length. To remember the fact regarding the square root, remember that 1 won’t have the square root symbol since the square root of 1 is 1. 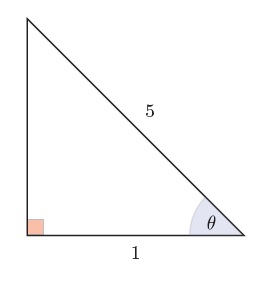 This will only leave the 2 (for the 45-45-90 triangle) and the 3 (for the 30-60-90 triangle). Since 45-45-90 triangle had the , the only one left would be for the 30-60-90 triangle. So it shouldn’t be too bad trying to learn all of this now! With this foundation, we can now apply the right triangle definitions to the common angles we learned above (30°, 45°, 60°, 90°) and their respective radian measures ( ). For 0, we will use the circular function definitions. We already learned that = 60°. Utilizing our right triangle definitions as well as the special triangles above, we can evaluate these values. Just remember our reciprocal identities and we follow the same steps as above. Remember to rationalize the denominator when you simplify. For 0 degrees and 0 radians, we can use the circular function definitions. In the unit circle, the radius is 1. The terminal ray is positioned along the x-axis and we are examining (1, 0). Similarly for 90° ( ), we can use the circular function definitions. The terminal ray is rotated counterclockwise and the point we are examining is (0, 1). Here is a table to summarize the measures of the angles located in Quadrant I. So far we looked at the measures of the angles in Quadrant I. We saw that the angles all had positive signs in Quadrant I. But what about finding the sine, cosine, or tangent of 150° or ? 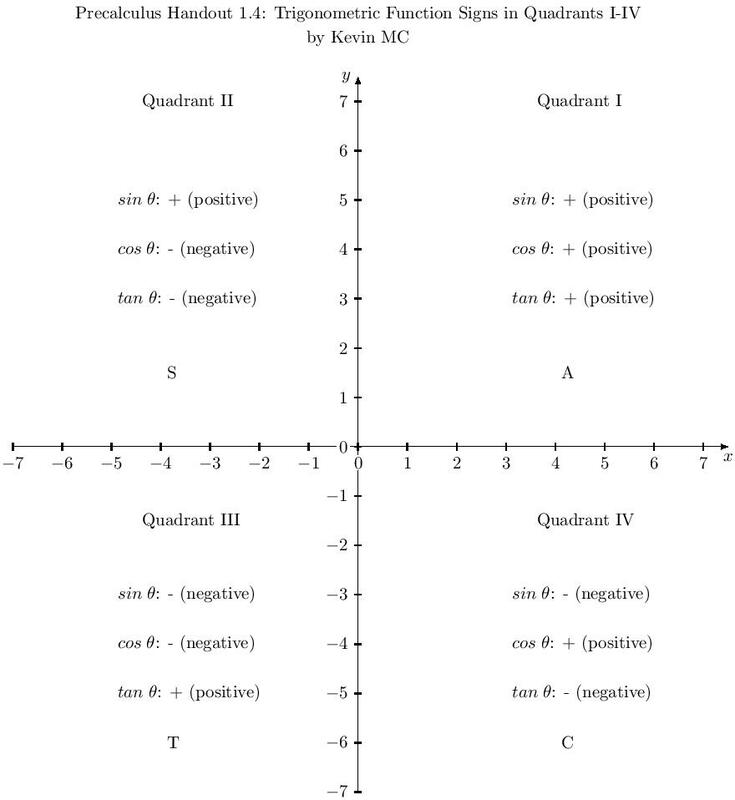 Let’s revisit the Quadrants from our previous handout on analytic geometry. Recall that the Cartesian (coordinate) plane is divided into four quadrants. The quadrants are numbered starting from the upper right and moving counterclockwise. As we evaluated the measures of the common angles in Quadrant I, we also noted that the signs were all positive for the trigonometric functions (sine, cosine, and tangent along with their reciprocal identities cosecant, secant, and cotangent). Before we discuss reference angles in depth, we will begin by looking at the signs for the trigonometric functions in the other quadrants (Quadrants II, III, and IV). When you take a look, it can get overwhelming to note the signs for the trigonometric functions. It is easy for Quadrant I since we already learned that the signs are all positive. However, learning the rest is simple using a mnemonic device. From the diagram I created above, you can see that I put the beginning letters A, S, T, and C in each quadrant. These letters tell you which trigonometric function is positive in that quadrant. You start with Quadrant I and move counterclockwise using the mnemonic above. From there, you can determine which signs are negative for the other trigonometric functions in that quadrant. Now we can take a look at reference angles. When we looked at our common angles and the special triangles, they referred to Quadrant I. With reference angles we will be able to extend Table 1.4b above to measures of trigonometric functions in Quadrants II, III, and IV. The reference angle is always positive and forms the angle between the terminal ray and the x-axis. Let’s apply this new knowledge into an example. Determine the sine, cosine, and tangent of 150◦. Step 1: Find the reference angle θ.
Utilizing our conversion from degrees to radians we note that 150° = . In both cases we will get the same result (only one is in degrees while the other is in radians). We can see that 30° = . Since our reference angle is 30°/ , we can use that to find sine, cosine, and tangent of 150°. Step 2: Determine the signs for the trigonometric functions in that quadrant. From our mnemonic above, we noted that sine is positive (along with its reciprocal cosecant) in Quadrant II. Cosine and tangent (along with their respective reciprocals secant and cotangent) are negative. The signs are where many students make mistakes after calculating the reference angle. They usually will note the correct measures, but have the incorrect sign. For example, writing and when cos θ and tan θ are negative in Quadrant II. Just make sure to keep the signs in mind with respect to the specified quadrant. Now that we’re more comfortable working with the quadrants and finding reference angles, we will now take a look at reduction formulas as we move clockwise. Remember that angle measure is negative when we move clockwise. If you are given an angle (whether in degree or radian measure) which is not from a common angle, you will need to use a calculator to find the approximate measure. For example, tan 15° or . Just make sure to appropriately have it in either degree mode or radian mode. If you want tan 15° and input tan 15 in radian mode, you will get a completely different answer. To finish up, let’s do a few examples applying everything that we learned. Evaluate the six trigonometric functions for angle θ with point (3, 4) on the terminal ray. Since the point (3, 4) is in Quadrant I, we won’t have to worry about signs because all of the trigonometric functions are positive. Using the circular function definitions of the trigonometric functions, we’ll be able to evaluate the functions for angle θ. We have a 3-4-5 right triangle. 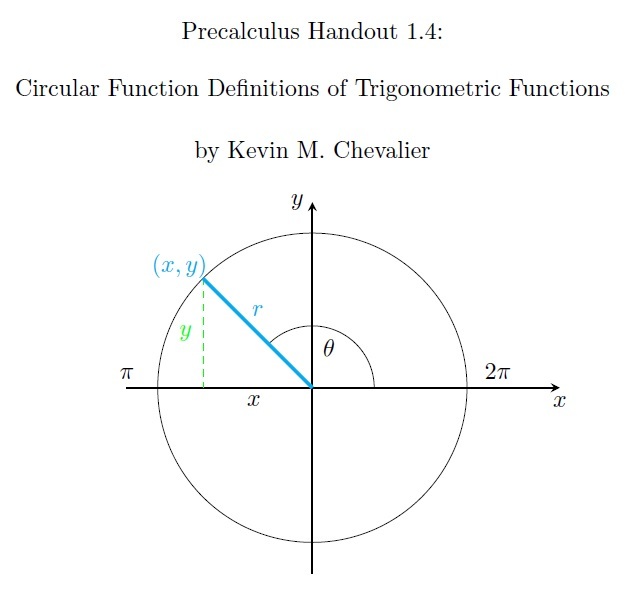 Now we have all of the information that we can use for the circular function definitions of the trigonometric functions. Determine the quadrant where θ is located. We know that sec θ is the reciprocal of cos θ. Since sec θ is > 0, we have to check where cos θ is positive. Cos θ is positive in Quadrants I and IV. To narrow down further, we check where tan θ is negative: either Quadrant I or Quadrant IV. Since tan θ is positive in Quadrant I, our answer is Quadrant IV. 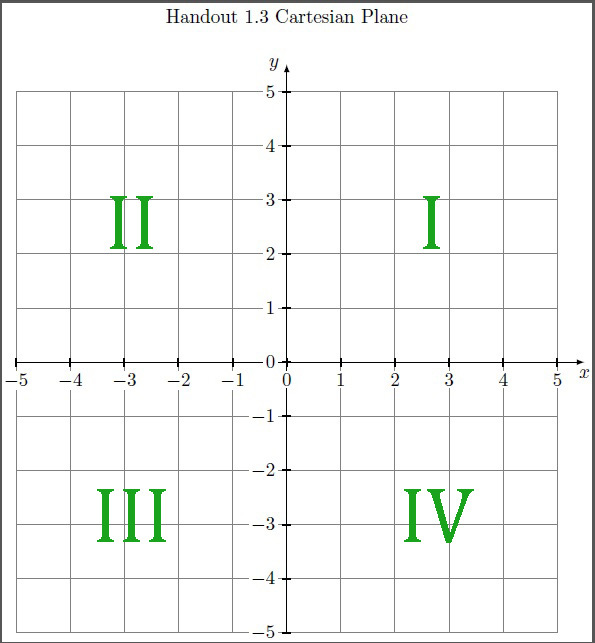 θ is located in Quadrant IV. We are given the information in the diagram. We have to find sine which is . To do this we have to find the opposite side so that we can determine sin θ. In Part II of the handout, we will continue with solving trigonometric equations and graphing trigonometric functions. We will derive more formulas such as the sum, difference, half-angle, and double-angle formulas. For graphing, we will look at period, amplitude (for sine and cosine), and transformations of trigonometric functions. To sum everything up, I will include a unit circle designed by Supreme Aryal that you can reference.